Emergency Evacuation Plans - For a Safer Workplace. Comply with local fire ordinance requirements IBC and NFPA. The posting of emergency evacuation plans and evacuation maps allow for greater building occupant safety. EvacMap diagrams indicate the viewer location on the floor plan, provide emergency evacuation routes to designated exits and present fire/safety equipment locations with written evacuation instructions. Strategically placed emergency evacuation maps continually educate and inform building occupants with fire safety and evacuation instructions. All EvacMap building evacuation plans are custom-made and tailored to the facility and to client needs. Numerous displays and casements are available to suit any manufacturing or workplace environment. "An emergency action plan must be in writing, kept in the workplace, and available to employees for review. However, an employer with 10 or fewer employees may communicate the plan orally to employees." "Obtain a FREE no obligation Quote... on your desk in 24 hrs." To obtain a quick quote on building evacuation sign projects, simply complete the "Quick Quote" form and an itemized quote will be on your desk the following business day. Larger facilities (+100,000) will require that floor plans be submitted with the quote request. "Delivering Efficiency and Savings On-line"
On-line access allows for simplified communication, project verification and increased efficiency. On-line access allows staff; co-workers or fire safety officials to view drawings anytime. One-time charge for the unlimited placement of equipment and safety icons. Custom Design elements provide clear information delivery. The widest selection of quality sign displays. Free CD of EvacMap drawings with casement purchase. Facility location maps: Indicate your property and building lot, surrounding roads, evacuation assembly areas and vital fire fighter or emergency response team entry information. Emergency response pamphlet: Building evacuation and location maps are included with your essential evacuation instructions; neatly condensed into a pamphlet (5.5" x 8.5" heavy stock paper - lamination available). 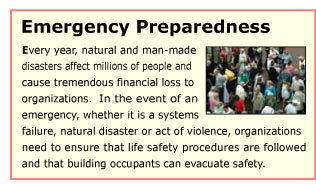 Emergency response pamphlet are customized to your Emergency Action Plan and are distributed to all employees or building occupants. The pamphlet outlines procedures taken during a fire, natural disaster or other emergency situations. Photoluminescent signs and wayfinding markers (all aluminum construction): Your source for high quality photoluminescent fire safety signs, UL and ULC listed Exit signs, floor, stair and wall directional markers and stair treads covers. Custom orders welcome. Site-surveys and installation: Services available by appointment for regional clients. Out of town clients please call.